Miriam was raised in a home where church attendance was seldom, and the fear of the Lord nonexistent. She had no outlet for the fear, shame,and hurt she had experienced. Molested by a family friend. Someone she trusted dearly. Miriam Passmore, Evangelist, Woman of God, struggled from the pit of victimization at an early age to survival, by being a tomboy and unconsciously becoming the very person she was molested by. Compounding the problem, her family was constrained by society and had no idea how to deal with a child in emotional pain. With the lack of understanding and guidance from her family, Miriam struggled with her identity. Her crisis led to a life filled with alcohol, tomboy activities and an unhealthy connection with women. That struggle within became a weapon for the enemy to use to deceive Miriam into taking on the role of a man in a lesbian relationship. She lived with the consequences of that act for over 20 years as a male impersonator. Her young mind latched on to the idea that women were weak and could be easily taken advantage of. That thought germinated into a life for Miriam that pursued with every endeavor to reduce weakness ultimately to become her symbol of strength by being a man. "There was a war going on inside of me that I didn't know how to fight. Many times I cried, I cried out to God why did you make me this way?" God's answer to Miriam's cries came in the form of David Cox. "He deliberately put himself in my way to tell me about the love of God." That day David leading her in the sinner's prayer, Miriam began her journey of deliverance. Many things began to trouble her, she became convicted by them. This was the time the Spirit of the Lord was drawing her. Then the Lord allowed a beautiful thing to happen in her. "I saw my womanhood, my feminity for the first time. I began to see the woman in me and knew that I could never sleep with another woman." Miriam's life and it's struggles show the grace and long suffering of God. 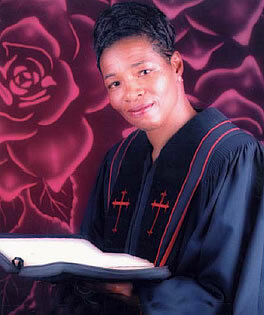 Out of a twenty-year lifestyle as a lesbian, God has borne a ministry that reaches out to those living in homosexuality. He took someone that was bold to the point of wearing tuxedos to Gay balls, with a passion for gay rights, turned her life around and has made her become a bold woman of God. Her ministry reaches out through seminars, and conferences, counseling and teaching homosexuals how to overcome that life. "The way that God has designed my ministry is to speak the truth, teach it and apply it with the Spirit. It's all about love.